The museum’s collection numbers over 10,000 items ranging from objects to archives, including research papers, family histories, maps, gravestone inscriptions, photographs, house histories, etc and our online catalog can be searched by keyword. This room contains mainly published volumes on various topics relating to Connecticut and its history. You’ll find books on general topics such as church history, as well as books that are more specifically local, such as bound photostat records of the Washington Congregational Church. The Connecticut Room also contains work by local authors, from the well-known to the obscure. If you are researching your family’s history, a number of sources are available. These include the church records mentioned above, some published family histories, published military records, town history books, mostly written in the 19th century, and compilations of vital statistics, often listed with the town histories. One book which is an invaluable, though not infallible, resource is William Cothren’s History of Ancient Woodbury, first published in the 1850s and revised and updated into the 1870s. Volume III is a compilation of birth, baptism, marriage and death records from the five towns that originally were part of Woodbury. It is a useful starting point for researchers looking into family history. If you are unable to find what you are looking for in the published volumes on the shelves, there are vertical files with history papers relating to the town’s history. These files are arranged by subject, in alphabetical order. All of these items can be found in the Library’s catalog. We encourage you to share anything you uncover with the museum so that we can help future generations and others with questions about local history and genealogies. 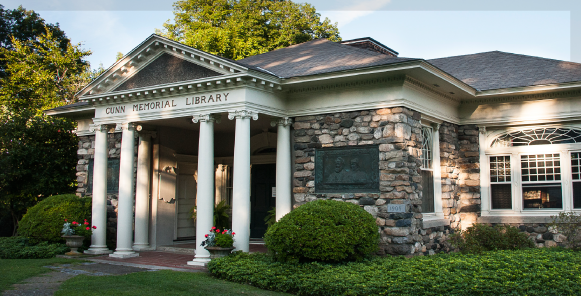 The Gunn Historical Museum maintains a limited number of burial records for the seven cemeteries located in Washington: Judea Cemetery, Washington Green Cemetery, New Washington Green Cemetery, New Preston Cemetery, New Preston Cemetery – Pickett Annex, Davis/Davies Hollow – Romford Cemetery, and Averill Family Cemetery. It is usually best to directly contact the cemetery associations that maintain the cemeteries and their records with your inquiry. Please direct your inquires to the local churches for membership, baptism, marriage, etc records. First Congregational Church, St. John’s Episcopal Church, Our Lady of Perpetual Help Catholic Church, Salem Covenant Church (formerly the Swedish Congregational Church), New Preston Congregational Church, and St. Andrew’s Episcopal Church. Land records are stored at Washington Town Hall. Please contact the Washington Town Clerk for assistance: (860) 868-2786. Remember prior to 1779 the area that is now Washington was part of the towns of Woodbury, Kent, Litchfield, and New Milford and their town clerks may have early records of interest. The Gunn Historical Museum does not have probate records in its collection. Washington is part of Connecticut Probate District 22 headquartered in Southbury and inquiries should be directed to them at (203) 262-0641.